With Pumpkins everywhere, Jesse and Cady tied the knot at Paradise Cove in Orlando, Florida. Just across Interstate 4 from the Walt Disney World Resort, Paradise Cove is a beautiful escape, on a tranquil lake, in the heart of the tourist district. 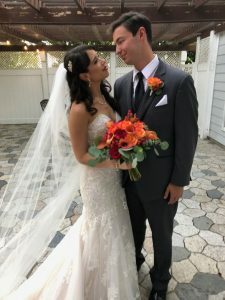 Cady envisioned a beautiful fall inspired wedding and so with the help of Kayli Coleman at Paradise Cove, they brought that vision to life. Pumpkins and fall foliage adorned the aisle, the arch, the tables and chairs. Jesse and Ryan even included Pumpkin wine in their custom ceremony, they created with Rev.Glynn Ferguson from Sensational Ceremonies. He also gave them a homework assignment to write and tell him why they loved each other. Cady wrote : From the first day that I met you in the hollywood suites you were so incredibly charming, funny, handsome and extremely talented. You had this air about you that drew me in at every turn. I was head over heels for you from the moment we started dating, and I very quickly fell in love with you. I have never met anyone who has truly been so kind, passionate and full of possibilities for the future. We bonded instantly over Jaws & ET and in those early moments, those conversations meant the world to me. You became my very best friend and I knew early on that you would become the man I was going to marry and spend the rest of my life with. When we then took a leap of faith a year later and moved to West Chester, I saw how committed & determined you were to be in this together. Here we are 3 1/2 years later, and we have been through almost everything imaginable…but we conquered it together. I have never been happier in my entire life! You are a gift to this earth and I love you more than anything in this world. I believe we were both put on this earth to meet each other and spend eternity together. It means so much to me that you want me to be your wife as I can’t wait for you to be my loving husband. I will promise to take care of you for the rest of my life and support you in all of your dreams & wonderful even crazy ideas! I am so thankful to have you & I thank god every day that I found the man of my dreams & love of my life, the future father to our children, the dog and cat dad to our sweet animals, the man who I want to have endless adventures with and love forever. Jesse wrote: Cady. The moment we met one another, the first thing I noticed about you were your eyes. Your beautiful brown eyes. They tell a story – a story I’m so fortunate to be apart of every day. Your generosity, thoughtfulness, and compassion, I see it in your eyes. Your struggles, your journeys, your triumphs, I see them in your eyes. It’s these beautiful brown eyes that welcomed me into your life, your family, and your adventure. They tell a story of the hardest-working person I have ever met, the most courageous, the strongest. They lift me when I am feeling blue, encourage me when I’m feeling reluctant, and inspire me when I have given up. Your beautiful brown eyes have led you to this moment, where through the grace of God and our unwavering commitment, we are here together. I make a promise to you now to always reflect back upon your eyes these qualities I have fallen in love with. Qualities like the effortless love you show. The joy you inspire. The warmth in your heart. I make a promise to you now to never take for granted every opportunity we have to build each other stronger, to face new challenges together, and to continuously, harmoniously, aspire to reach greater heights, always together. Every morning will be an opportunity to fulfill these promises to you. Every morning, for the rest of our lives, I will be blessed with the opportunity to gaze deeply into your beautiful brown eyes. Our DJ Rocks provided the music for the ceremony and kept the dance floor rockin’ all night long. Cocktails Catering provided the scrumptious appetizers and meal for Jesse, Cady, and their guests.